While most retailers take advantage of various tactics of digital marketing, many brands still lack significant online sales. The most frequent question, how do we improve our online sales. Digital marketing drives brick and mortar sales, but it must be done properly. As more shoppers use smart phones, tablets, and computers to search for products, retailers need a more comprehensive digital marketing strategy. Retail marketing efforts are often stretched thin due to staff or budget, or both. People in charge may not understand properly the required actions of their staff or budgets required to contract it out. Consulting services can give lots of clarity to decision makers prior to allocating budgets. Marketing consulting services can assist a retail brand with strategy, knowledge, and even project management. Since most shoppers go online (over 80%) to research products and gifts, retailers must have a strong online presence. Digital marketing tactics such as Search Engine Optimization SEO, Social Media Marketing SMM, Video Marketing, Blogging, and Paid Advertising can significantly improve a brand’s online sales. Retailers that want to produce sales must have proper retail websites to do so. These must be professionally designed and developed. They have to be highly optimized. The retail website must be easy to use with quick simply checkouts. Also, these retail websites must have strategically call to action and incentives integrated throughout the home page, shopping pages, and other key website pages. The content also must be 100% uniquely written for the site. Text should be professionally created as well with SEO in mind. Incentives should be given for online sales and shoppers buying at brick and mortar stores. This is a difficult one. Most brands simply to not understand what realistic expectations look like. It is difficult to understand what results to expect from digital marketing campaigns. Learning and understanding expectations from different marketing tactics is critical. Differences between organic marketing vs. paid advertising is important to understand. Some marketing tactics are more of a long game while others produce quicker results, but maybe not as impactful. Brands should understand how the different techniques work and also how they work with each other. It is a comprehensive approach, digital marketing. Managing the marketing campaigns should be left to professionals. Having a single point of contact as a retailer and someone who can manage digital marketing campaigns successful is highly beneficial. Retailers often feel overwhelmed managing multiple digital marketing campaigns. Improving them certainly is more difficult. Having experts that can quickly see opportunities for improvement is critical for retailers. Digital marketing efforts can be professionally managed, outsourced, and streamlined by professional marketing services. This allows retailers to focus on sales-oriented activities. Brick and mortar sales as well as online sales. This can include sales incentives, promotions, giveaways, freebies, contests, polls, product development, and so on. It allows retail brands to work with a professional partner. 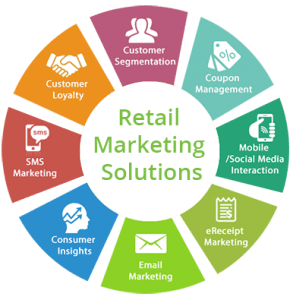 Retail marketing services give retailers lots of benefits. Call an agency specializing in retail marketing services to get a consultation.